The $244 Ecobee4 Smart Thermostat borrows all of the best stuff from Ecobee’s older thermostats. 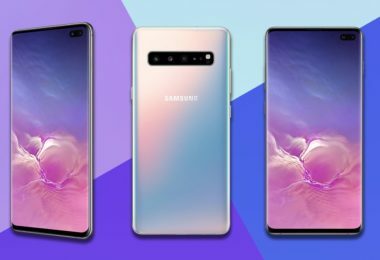 It has a responsive touchscreen display, a remote temperature and proximity sensor, intuitive mobile and web apps and integrations with Amazon Alexa, Apple HomeKit, Samsung SmartThings and IFTTT. But instead of simply working with Alexa, the Ecobee4 itself is an Amazon speaker. At first glance, the Ecobee4 is barely distinguishable from the Ecobee3. Its face is a rounded black square with a smartphone-sized touch screen in the middle. The biggest noticeable difference is a small blue LED bar along the top, which lights up when Alexa is activated. While the unit doesn’t feel or look as premium as the Nest’s elegant stainless-steel dial, the Ecobee4 is minimalist and unobtrusive. The interface is largely the same, with the current temperature displayed prominently and a slider along the right to adjust the heat or cooling. A small microphone icon in the lower right lets you activate Alexa manually. Let me start off by talking about my initial thoughts about having a smart thermostat show up at my house for review. Bluntly put, I was pretty nervous and scared. Why you ask? Let me explain a bit. I moved into this house May 1st, 2017 and in the middle of June the AC unit went out. At the time the AC was electric and the heat was run on gas. After talking to my landlord and her talking to her AC guy, she decided to go with a unit for the AC and the heat that were both electric to save herself a bit of money. No big deal you ask so why are you scared? While I know the basics about electrical stuff such as hanging a ceiling fan, a porch light and that kind of stuff, I’ve never in my life messed with a thermostat. And I of course was thinking what a horrible time to do so now with a brand new AC/Heat unit sitting outside my backdoor that just cost my landlord several thousand dollars. If I screw it up, how mad is she going to be? What got me to thinking this way was simply because of the multiple wires. It’s not just a white wire and a black wire and possibly a ground wire. In my case, it’s 6 different colored wires. For now, I’ll end here on this and talk about installation in the next section. Once I opened the box and saw my new Ecobee4, I was speechless. This was a thing of beauty and I couldn’t wait to get it all setup, hooked up and on the wall. The first thing I noticed is that Ecobee clearly demonstrates their understanding of the importance of a well laid-out box opening “experience.” It feels downright iPhone-ish (that’s a good thing). 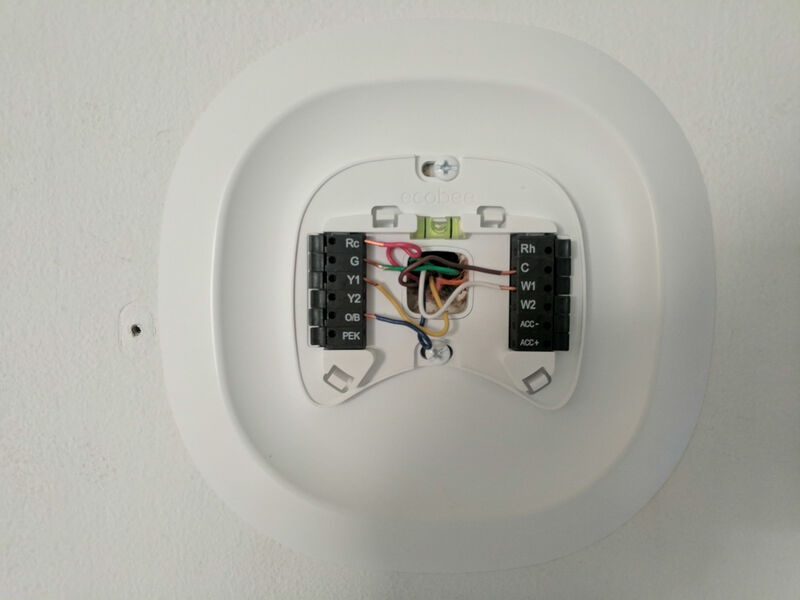 DIY geeks like me get warm fuzzies due to the attention to detail, while those who might otherwise feel a bit intimidated about installing a smart thermostat for the first time get a “Well this isn’t so bad!” vibe. The next thing I noticed was Amazon’s Alexa circular logo proudly displayed on the front of the box. The official phrasing from Ecobee is that the new Ecobee4 features “built-in Amazon Alexa Voice Service.” But that’s just a fancy way of saying that for almost all intents and purposes, the Ecobee4 is an Amazon Echo Dot and an Ecobee smart thermostat mashed up into one device that sits on your wall; and in addition to SmartThings and IFTTT, also supports Apple HomeKit. As far as I know, it’s the only device currently on the market that combines Amazon Alexa and Apple HomeKit technologies in the same unit. I shudder when I think of the machinations Ecobee CEO Stuart Lombard and his executive team had to go through to negotiate that type of licensing; while still keeping the Ecobee4’s price point competitive with other industry players. But that’s not my job, it’s theirs! Mine is to play with stuff and see if I can break it talk about the experience. Compared to the Ecobee3, the Ecobee is slightly larger in size and this isn’t a bad thing from what I’ve heard others say who have now had both devices. The Ecobee4 is even a bit more round compared to the previous model. 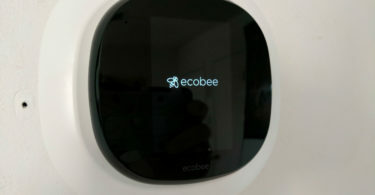 As far as the touchscreen part of both devices, they appear to be the same size though the Ecobee4 might have an ever so slightly larger touchscreen. Thickness wise the Ecobee is slightly thicker than the previous Ecobee3 but that’s likely due to the fact that the Ecobee4 has to make room for all of that Amazon Alexa goodness with a speaker and such. The rear of the Ecobee4 reveals a number of vents, which I’m guessing are for ventilation (up top) as well as microphone (lower right) and speakers. As I mentioned above, this is the part I was most worried about. Simply because I didn’t want to short something out by hooking something up incorrectly. However, once I opened the install guide book that Ecobee sends with the Ecobee4, I was put quite at ease as there are literally step-by-step instructions. When I say step-by-step, I’m talking about how it tells you about inserting and screwing in each individual screw, leveling the base plate, unhooking your old wires and labeling them with letter coded stickers and much more. 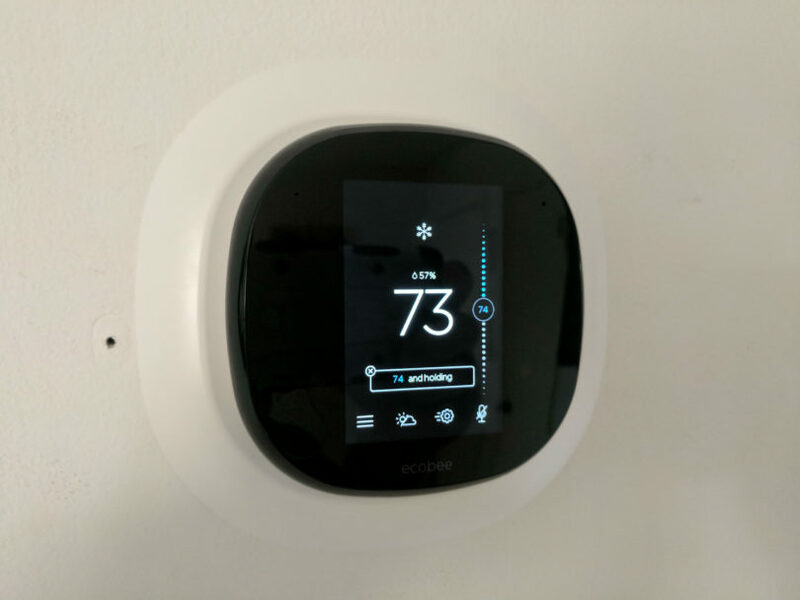 Whether you’re coming from an Ecobee3, another type of smart thermostat, or even an old-school “dumb” thermostat, installation shouldn’t take you more than about 20 minutes if all goes well. For me, it took me right about that amount of time mainly because I was a bit over cautious and nervous. First, I turned off the power switch at my furnace. 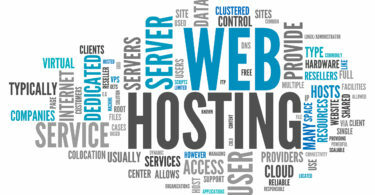 This is very important simply because there are several bare wires that you will have and if any of them touch each other or any other metal, they can and will short things out and cause you some serious headaches. Next, I took a picture of how my previous thermostat was wired just to make sure I didn’t make any mistakes or could revert/change things if I did mess something up accidentally. My wires’ colors happen to correspond to the letters on the old wiring harness, but don’t assume that’s the case for your thermostat. The Ecobee install guide will explain how to identify the proper wires on your HVAC unit to make sure you’re wiring things up properly. However, if your colors do match up like mine, you can proceed with ease. I then proceed to remove my old(it was only 2 months old as it was replaced with my new AC/Heat unit) Emerson electronic thermostat by undoing all of the wires and unscrewing it from the wall. Because I have screw holes in the wall from the previously installed Emerson thermostat, I opted to use the trim ring that comes with the Ecobee4 to hide the holes. Luckily this covered most of the holes, but because my Emerson thermostat was a long one, the trim ring for the Ecobee4 didn’t cover up one of the holes. Certainly not a big deal as the hole is small, but still it’s there and can be noticed. This is of course no fault of Ecobee’s. For most people they will probably feel that not mounting the ring would look better but for me personally I really like the look of the trim ring so I have no plans of taking it down unless I move of course. One thing to note here is that the trim ring can be painted very easily with spray paint or something similar. I saw a few pictures from someone on Twitter who tagged me showing off their trim ring on the wall in a black color. So if you prefer something other than white for the trim ring, there’s always options. It was as simple as two screws that hold the base plate and the trim ring to the wall. There is a built-in bubble level on the base plate itself so that you make sure you get everything mounted in a level position. Once all of that was complete, it was then time to hook up the six color coded wires and make sure they are connected into the right slots and done so firmly as to not slip out of their connectors. It is very important to note that when you placing your wires into the connectors, you need to make sure when you press it in there that you actually hear it snap as that ensures it is firmly in place and won’t come out accidentally. Once you verify the wires are connected, and I emphasize you to double and even triple check to make sure there are no wires in the wrong places, it’s then time to flip the breaker back on and of course pray for no sparks. But of course I have faith in you as does Ecobee with their top notch, detailed instructions that everything will be just fine. 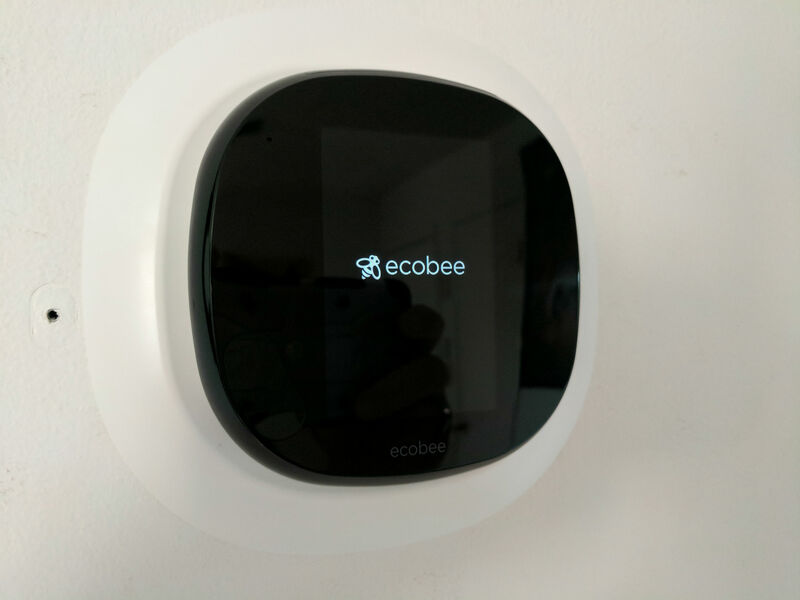 Once you flip the breaker on, then snap the Ecobee4 itself onto the base plate and when you do it will begin to power up and get you ready to walk through the setup and configuration of the thermostat itself based on what kind of system you have in your house. Once it gets through the boot-up stage, it’ll bring you to a screen verifying your wiring configuration. For me, I simply looked at the picture I had taken earlier to check one more time that everything was correct. Then I simply hit the YES option to move on to the next step. I continued through a couple of basic questions then I was brought to the screen to connect the Ecobee4 to my Wi-Fi network of choice. 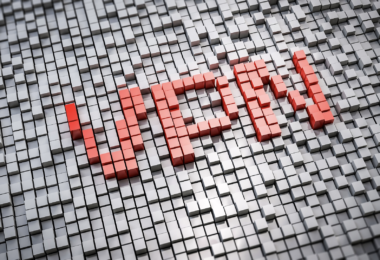 For me I chose to select my network and enter my password, but there’s also an option here that you can choose to use your iPhone, iPad or iPod which utilizes the HomeKit setup wizard on iOS devices for quick, easy and painless Wi-Fi configuration. Regardless of which option you choose, you’ll breeze through this step and after a couple of seconds or so the Ecobee4 will tell you it’s happily connected to Wi-Fi. The next step was to link my Ecobee4 with my Ecobee account using the Ecobee app on my Google Pixel XL (naturally, there’s also an app for iOS devices). If you don’t have an Ecobee account yet, the app lets you set one up. Once the account is set up, the Ecobee4 generated a registration code which I typed into my app on my phone. Once you connect the Ecobee4 to your Ecobee account, you then have the option to setup the Amazon Alexa stuff. 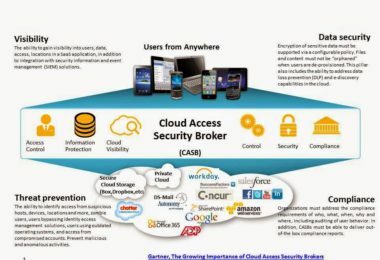 To get this setup however, all you need is your Amazon account username and password. Once you supply that a pop-up window within the app will appear asking you to confirm that you want to link the accounts together and grant access. Even though I did end up disabling Alexa for now as I stated, when I first enabled it I did do a couple of commands to verify it was working and to hear how the speaker sounded. I did a simple, “Alexa, what’s the weather?” and the blue indicator light near the top lit up and Alexa started speaking to me and telling me how damn hot it was outside because I live in the south. I tried a couple of more commands then proceeded to disable it as mentioned above. I did notice that the speaker is just ok on the Ecobee4. It’s not the greatest by any means, but it could certainly be worse. Not something you want to stream your favorite Spotify music playlist from I’m sure. If you do, that’s all on you. By default, the wake word for every Amazon Alexa-driven device is “Alexa.” It’s the word she listens for, and then “wakes” to interpret the next words you say. For most users, the default is fine. But for users with family members whose names sound very similar to “Alexa,” it makes sense that you’d want to change that. On Amazon Echo devices, you can select between “Alexa,” “Amazon,” “Echo,” or “Computer” as possible wake words. Star Trek fans will, naturally, select the latter. 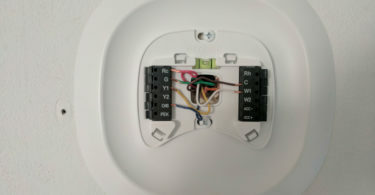 I would advise you change this on the Ecobee4 as well, but this is where I found my next little issue with the Ecobee4. I pulled up the Amazon app and went to the screen that lists my Alexa devices and found my Ecobee4 device. Normally there’s a Wake Word option here for any of your Alexa powered devices as this can be changed on any of them. However it seems this isn’t the case with the Ecobee4 and I’m hoping this is something that Ecobee plans to fix or change in a future update via the software. Next, I tried to control the Ecobee4 temperature settings via voice command. 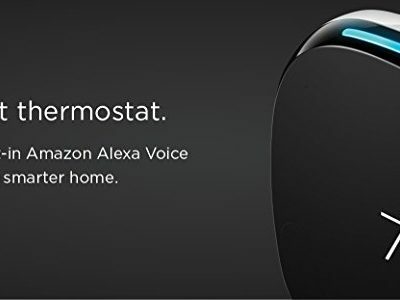 I said “Alexa, set Living Room to 73.” But Alexa complained that there was no device named “Living Room.” I realized that was likely being caused by the fact that I hadn’t re-run Alexa’s discovery of smart devices, which you can do with a button press in the Alexa app or via voice command. I chose voice command and said “Alexa, discover devices.” The Ecobee4 responded “Starting discovery. 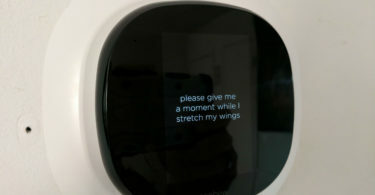 This can take up to 20 seconds.” A few seconds later, she responded “Discovery is complete.” I tried the original command again: “Alexa, set Living Room to 73.” But again, she complained that there was no device named “Living Room,” and while I could see the Ecobee4 in the list of Alexa devices in my Alexa app, it did not appear on my list of Smart Home devices (which is in a different section of the app). I verified that the Ecobee skill was enabled in the Alexa app, but decided to also try disabling and then re-enabling the Ecobee skill in the Alexa app, then re-running Alexa discovery. That did the trick! The “Living Room” device showed up as an “Ecobee thermostat” device in my list of smart devices. 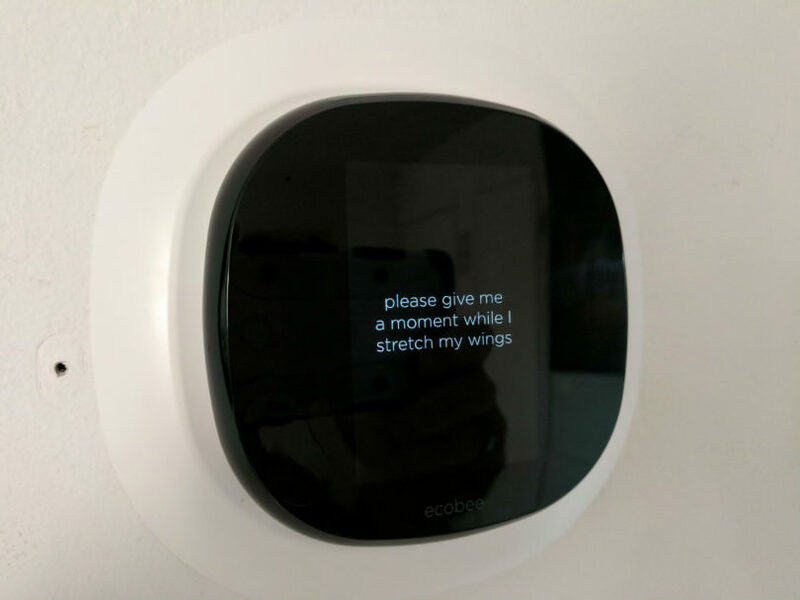 For those adding their first Ecobee thermostat, I doubt this will be an issue. But if you’re adding an Ecobee4 to a setup where you already have the Alexa Ecobee skill enabled in the Alexa app, I recommend disabling and re-enabling the skill (it’s literally two button presses) to make sure Alexa’s Smart Home discovery can “see” your new Ecobee4. While the Ecobee4’s Amazon Alexa integration is touted on the front of the box, the Ecobee4 also works with the most popular home automation ecosystems such as Samsung SmartThings, Apple HomeKit, and IFTTT. It took me less than 3 minutes to configure the Ecobee4 to work with my SmartThings Hub, which allowed me to control the Ecobee4’s functions through my SmartThings mobile app as well as via voice control through Alexa to SmartThings (which works very much like Alexa’s direct control of an Ecobee thermostat via the Alexa Ecobee skill). There’s so many things here that you can do that I urge you to explore and dig around and try various things to see if you can get them to work via some kind of control via your Ecobee4. Of course, this wouldn’t be a thermostat review if I didn’t stop geeking out long enough to test the actual thermostat functions of the Ecobee4. Quite simply, these work exactly as they do in the Ecobee3 from what I’ve read online. The included remote sensor is the same as those that ship with the Ecobee3. The interface is the same. The programming is the same. The reports are the same. The Ecobee3’s smart thermostat functions are excellent, so I appreciate Ecobee’s “if it ain’t broke, don’t fix it” approach. Those familiar with the Ecobee3 functions and interface will feel right at home with the Ecobee4. Like its predecessor, the Ecobee4 supports a wide array of heating and cooling setups, and also supports one auxiliary device, such as a humidifier or dehumidifier. There are a lot of Ecobee3 users out there whose input drives development, so I predict that anything that does pop up on the Ecobee3 that requires fixing will be pushed out via firmware to both the Ecobee3 and Ecobee4. Basically, the the Ecobee4 does everything the Ecobee3 can do, plus HomeKit support (which showed up part-way through the Ecobee3’s run) plus the Ecobee4-exclusive Amazon Alexa service. 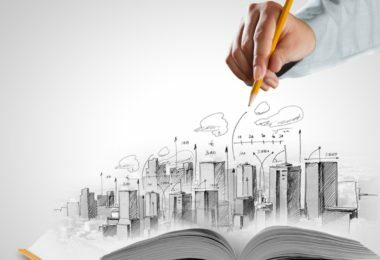 I did knock off a tenth of a point on affordability and let me explain why. Most people will feel that $249 is a bit much to pay for a thermostat and if you rent your home I kind of agree. It’s hard to spend that type of money on a place you don’t own yourself. With that said, most power companies will give you a rebate for buying such thermostats. I live in Georgia and use Georgia Power and they give you a $100 instant rebate if you purchase it through their online store. The price is a bit higher prior to that discount, but in the end it still comes out cheaper going through them than it would buying it directly from Amazon. It’s also going to seem expensive to someone who has never owned one before and doesn’t know the benefits of having one. 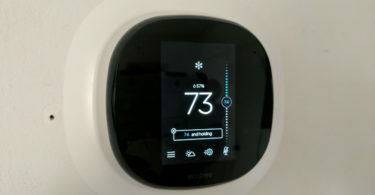 I was in both this boat and the one above, but after having the Ecobee4 sent to me for review, I can say without a doubt that I would purchase one of these smart thermostats in a heartbeat and not think twice. So if I can be of any assistance in helping sway your decision, do it. Just simply jump on it and purchase as you won’t be disappointed. Even if you have another brand of smart thermostat, I’d still suggest considering a switch to the Ecobee4. No other thermostat has its features or supports as many methods of home automation integration. If you were an early adopter of smart thermostats and your first-gen T-stat is getting a bit long in the tooth, the Ecobee4 is a perfect upgrade. I could only think of two groups who might want to think twice about whether or not the Ecobee4 is the right choice. The first group is Ecobee3 owners who already have an Amazon Echo device. They already have the same functionality, albeit shared between two devices, but if they really want the latest and greatest and have a good “hand-me-down” destination for their Ecobee3 (or can sell it on eBay), they may want to upgrade anyway. The other group where it might not make sense is homeowners whose thermostat location wouldn’t work well as an Amazon Alexa microphone location. For them, the Ecobee3 (which now has a lower price) might be a better choice. For me, the living room is a great place for my Ecobee4 as it’s open and works great with the Alexa integration and is away from my Amazon Echo Dot which is in the computer room. We use it constantly for alarms for family members to take medicine and similar other things. If the Ecobee4 is right for you, you can pick one up right now on Amazon.com. The Ecobee4 ships with one remote sensor, but you can purchase additional sensors for maximum coverage and flexibility. The price for the additional remote sensors is $78.98 for a 2-pack which is a great deal. 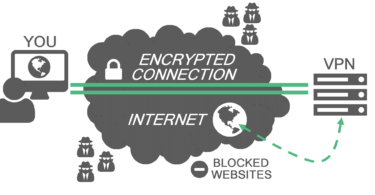 Why a VPN Service is Slightly Preferred Over Unblock Proxy?